Most people will agree that there’s nothing better than sitting down to read a good book with either a cup of coffee or a frothy milkshake. So at BGS Library, we’re really excited to be teaming up with our economics students as they flex their entrepreneurial and beverage making skills at the student-run coffee cart Blue Brew. Since week 5, all milkshakes and coffees have come wrapped in a highly collectable sleeve – you really cant miss them! Each sleeve has a custom design that really captures the fun of reading and getting stuck into a good book. With the final sleeve to be released in Week 9, students and staff are encouraged to keep hold of their sleeves, but don’t panic if you have missed a particular one, because in the final week of term there will be a chance to collect any sleeves you may have missed out on. Then from Monday, 19 March there will be entry forms at either the Senior or Centenary Library drop-off points, and also a staple so you can attach all five sleeves to your entry form. 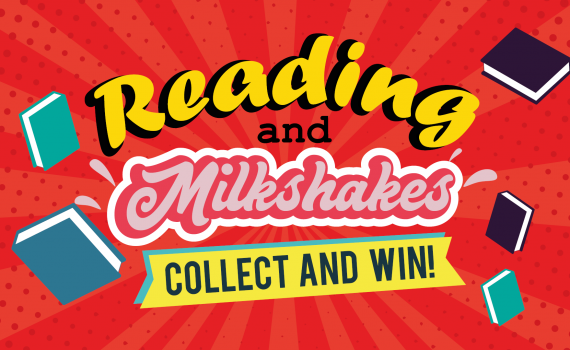 There are great prizes to be won like book vouchers and movie tickets so don’t forget to write your name and form year so we can get in touch with you if you’re one of our lucky winners! Entries for Term 1 will close Wednesday, 28 March and drawn Thursday, 29 March in the Learning Commons. Enjoy your reading and good luck!